I made a watch face for Anrdoid Wear which is in the Play Store now. It’s inspired by the clock tower at the Palace of Westminster, London, better known as Big Ben. Recently I was given an LG G Watch. As an introduction to Android Wear I loved it, I found the device much more useful than I was expecting. Not having to get my phone out of my pocket to check my notifications is surprisingly useful. 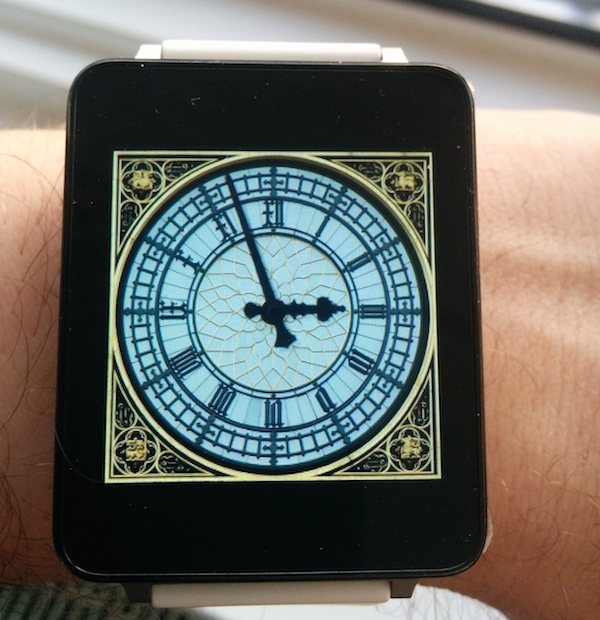 I also loved the ability to chose watch faces I’ve previously written about an animated Big Ben effect.This was written in SVG for use on the web, but I had a ‘light bulb moment’ when I realized that this existing could be adapted for Anrdoid Wear. Most of the difficult work (preparing the digital images and proving the concept would work) had been done. The first job was to update to Android Studio (I’ve been a long-standing Eclipse user to date) and to learn how to code for Android Wear. I was pleased to discover that it’s not too different to coding for a phone, it’s basically Android on the device, slightly cut down for the form factor. The hardest part for me was realizing how the two app executable (APKs) you have to deliver (one for phone, one for app) work together and how deployment (e.g. to Play Store) was supposed to be done. I studied the design guidelines and realized one adjustment would need to be made; introduction of an ‘ambient mode’ where the screen was mostly black. This meant drawing new stylized versions of the watch face and hands, which I did in Inkscape. I tried to capture the iconic Gothic style of the original while using outline effects so as to draw very little content in ambient mode. Code-wise it was then a matter of studying the watch face samples and producing my own version. 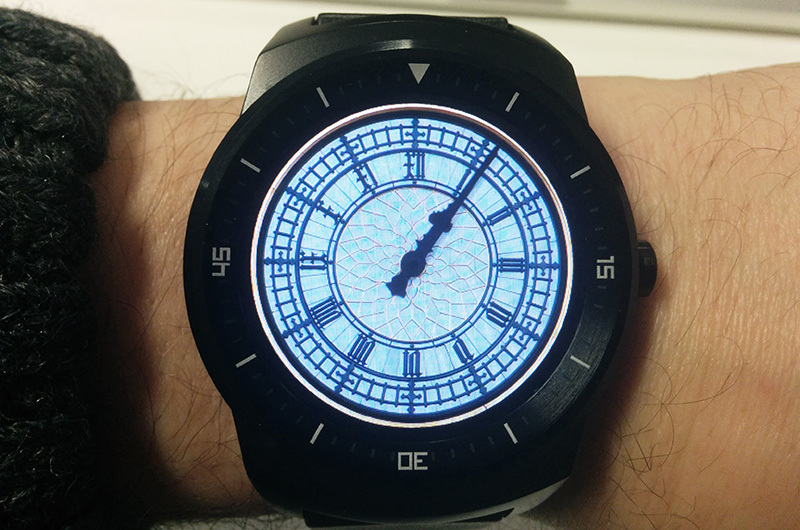 I used Android canvas to scale, rotate and overlay the bitmap watch face elements. The app can be download from the Play Store now. It requires an Android Wear watch with Android 5 (Lollipop) or better. Source for the project is available in GitHub.